“To the Batbasement” just doesn’t have the same effect. Batman begins hallucinating. I blame the abnormal drug trafficker. Stop being a child! It’s killing your parents! Spiderman stroking criminals… must be the p0rn version. How does one activate a criminal? Maybe there’s an app for that. He most be 50yo. He’s having an identity crisis. @DNT 0432. You tickle his larcenarse. @Marum | 4:42 am: Maybe a little felonatio too? @DNT I figure we have covered both sides of the problem. SpiderBat, SpiderBat, does whatever a SpiderBat does…..
Don’t follow the advice of Ra/’s Al-Ghul. He’ll just try to get you involved with Scientology. Fortunately, Bruce discovered the right basement, if he turned left and went into the Transworld basement, he would become Gayman Forever! With great equipments comes great convertibility. Robin never told anyone, that Buttman had great equipment. Although some observed, that he was able to sing two octaves higher. Directed by M. Night Shamalayan. While I’m not a big fan of Batman I’m going to go ahead and guess that Doctor Jackstraw the abnormal drug trafficker and Tougon the chief of mafia are not canonical characters. He used to have a huge mansion on an “Estate”. What, did Batman RETIRE to a small villa in a 55+ gated community or something??? Nobody told me he retired!!! Ohhhhh, Nooooooes!!! Anyway, someone needs to change the description from DVD to Bootleg game console. I kiss the hem of your purple Toga….’O enlightened one. That knowledge will stand me in good stead, were I to sally forth to Hong Kong or Taiwan, to purchase $h1tloads of pirated software which I have never yet, so far, needed. And am unlikely to ever need. My son brought me home a prated copy of Flight Simulator once. Like most of that crap, it didn’t work correctly, if at all. 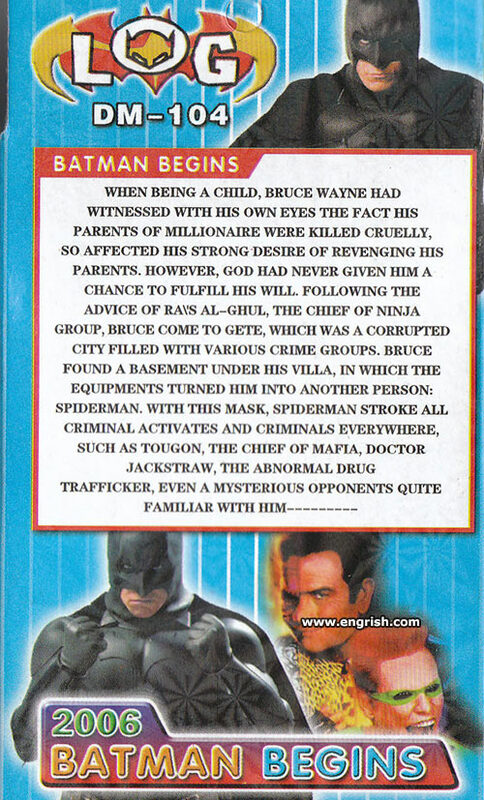 Wait… so, if Bruce Wayne is really Spiderman, does than mean that Peter Parker is really Batman? I’m so confused. oh yeah, I remember this from the Brog. I kind of miss the Brog, It was ill-defined and redundant but the unique stuff was fun. In any case, it’s sad seeing up there with no updates in 2 1/2 years.